FISSIONABLE MATERIALS: It is the same nuclear fuel cycle with its mining of uranium, milling, enrichment and fuel fabrication stages which readies the uranium ore for use in reactors, whether these reactors are used to create plutonium for bombs or generate electricity. In the end, both reactors produce the plutonium. The only difference between them is the concentration of the various isotopes used in the fuel. Each year a typical 1000 mega-watt (MW) commercial power reactor will produce 300 to 500 pounds of plutonium — enough to build between 25 – 40 Nagasaki-sized atomic bombs. ….…..It takes about 15 pounds of plutonium-239 or uranium-235 to fashion a crude nuclear device. The technology to enrich the isotopes is available for about one million dollars…. Australia has long been part of the USA’s nuclear war strategy. Pine Gap, USA’s secret facility in Central Australia, has since 1966 been a centre for espionage and for co-ordination of US air strikes. It has been part of America’s “Star Wars” plan to put missiles into space. American congressmen have made $millions from their investments in Defense Department contracts in Pine Gap, and can tour Pine Gap. But Australian Members of Parliament are denied entry. In recent months, Australia’s role in the USA’s nuclear war strategy has been stepped up. A new base, at Exmouth. will be added to the Northwest Cape joint communications base, for increased tracking of missiles and satellites, and potentially for cyber warfare. U.S. Military equipment will be stationed in Darwin and Townsville. There will be increased visits from U.S. military ships, and more U.S. military exercises in Australia. Being part of the American nuclear war machine makes a hypocrisy out of Australia’s supposed posture against nuclear weapons. NUCLEAR DISARMAMENT. Australia’, represented by Kevin Rudd and Gareth Evans, has been posing as a world leader in nuclear disarmament, prominent in developing policy for Nuclear Non–proliferation. A recent Parliamentary Inquiry into proposed uranium sales to Russia concluded that there were no meaningful safeguards to prevent it being diverted to weapons. The Inquiry recommended against selling uranium to Russia. Meanwhile Russia, apart from its notorious record of unsafe nuclear facilities, and smuggling of uranium, – Russia is supplying Iran with nuclear technology. But isn’t there a worry that Iran is developing nuclear weapons? NUCLEAR SAFEGUARDS Over 30 years ago, the Fox inquiry into uranium mining described safeguards as “an illusion of protection”. Nothing has changed. In fact it has got worse. 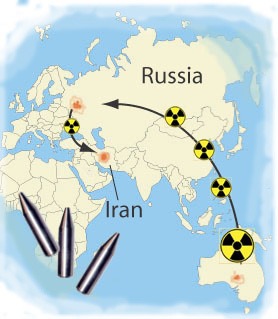 When it comes to Australia selling uranium – The Australian Safeguards and Non Proliferation Office and its Director General John Carlson give Australians a bland assurance that Australian uranium does not end up in nuclear weapons. These “safeguards” are a joke. There is no way of tracking Australian uranium as it weaves its way through the intricacies of the nuclear fuel chain. Australia sells uranium to China, with no assurance whatever that this uranium won’t go to China’s weapons program. China has signed the Non Proliferation Treaty, but not signed the Comprehensive Test Ban Treaty Australian uranium goes to Taiwan, which has not signed the Non Proliferation Treaty. Latest moves to sell uranium to Saudi Arabia would be a joke, if not so serious . Australian company Worley parsons was helping construct nuclear power in Egypt. I hop ethat has stopped – but you never know. 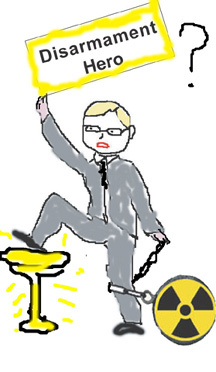 The Australian Safeguards and Non Proliferation Office (ASNO) and its Director General, John Carlson, are ineffectual. ASNO functions a convenient smokescreen for the uranium mining companies, which profit from foreign countries’ hunger for nuclear weapons. 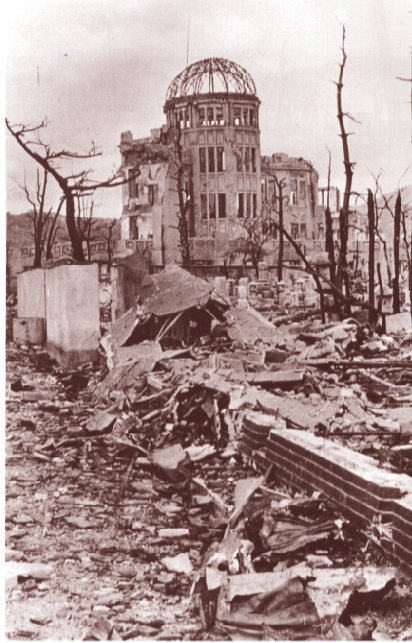 Does the Federal Government support nuclear weapons abolition? Is Minister Martin Ferguson not yet aware that nuclear energy sustains nuclear weapons technology and opportunity, notwithstanding any Australian Obligated Nuclear Material (AONM) conditions?